It’s incredibly easy to be invisible on the web. One of the big questions I get asked is, unsurprisingly, when I put my name/book title/topic into Google, why does my blog/website not come up top? To understand the answer to this, and to do something about it, requires a bit of basic knowledge about the art and science of helping webpages get found in searches – what’s commonly termed ‘search engine optimisation’, or SEO for short. The goal of any search engine is to deliver up the most relevant results. As well as relevance, search engines look for authority and for recency. 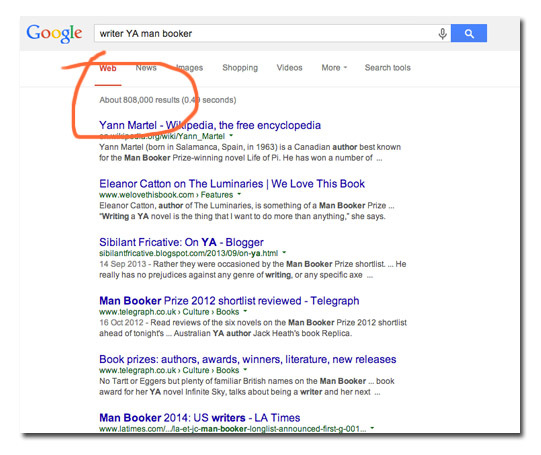 Search engines cannot ‘read between the lines’ or make intelligent assumptions. They take the words that are being searched for, scour webpages on which those words appear, rank those pages according to various criteria, and serve up the results. Yes, the calculations they employ (algorithms) are complex, but they are nothing compared to how the human brain operates – this is why we don’t always get the search results we’re expecting. Once you’re clear about these 3 points it becomes easier to optimise your blog or website. The exact algorithms used by search engines are top secret and change all the time. This is simply because there’s BIG MONEY in getting high Google rankings. For some businesses, such as financial services, travel and the big ecommerce sites, the difference between coming up 3rd or 13th in a search can be millions of pounds in lost business. For you or me, it’s probably less crucial. But that doesn’t mean it’s not worth knowing a bit about the game. 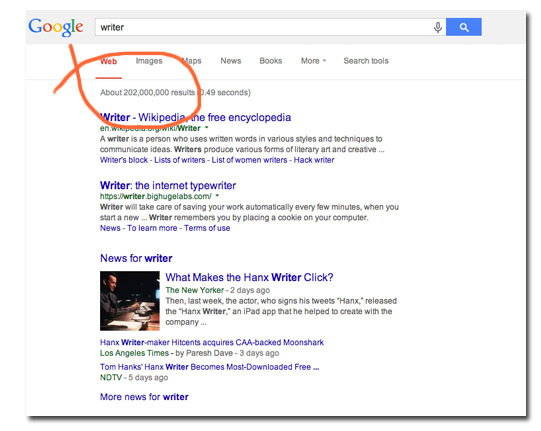 Let’s start with keywords – the words or phrases people are searching for. When people search for ‘ABC’ on Google, I want them to find my blog/my author page on Goodreads/my article about XYZ. Keep going until you have a list. They may be single words (eg ‘writer’), or phrases (eg your name, or ‘fantasy writer Kent’) or groups of words (eg ‘writer YA Man Booker’). Try different combinations of similar phrases. If you run out of ideas, scoot around the websites of others in your genre, or the discussion forums on Goodreads or niche community sites and see if any more phrases occur to you. Now try searching for those phrases and see what comes up. At the very top of the search engine results page (sometimes this gets abbreviated to SERP) you can see how long the search took and approximately how many pages were searched. This tells you how competitive a phrase is. The more competition, the harder it’s going to be to be ‘top of Google’ for that phrase. Notice that for this search there are a mere 808,000 pages deemed to be relevant. So the phrase is less competitive than ‘writer’ and more targeted. 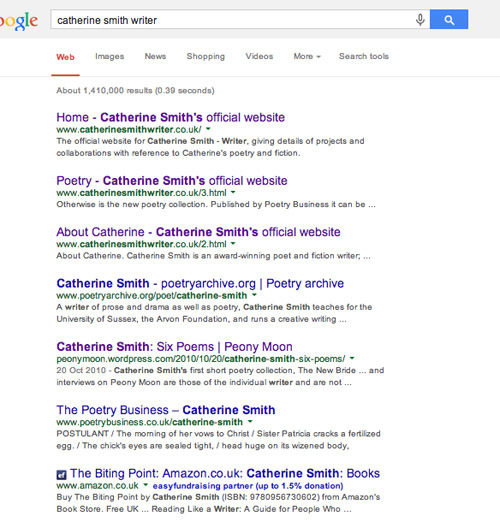 Compared to the search results for ‘writer’, these results look pretty close to what the searcher is looking for. 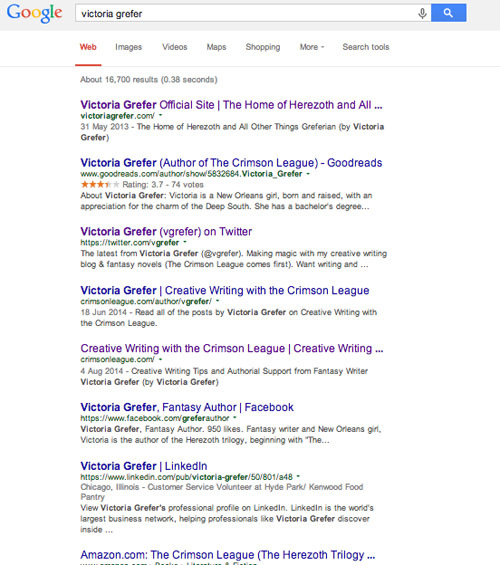 Victoria has managed to dominate page one of Google. Because her name is relatively unusual, she starts with an advantage: there are just 16,700 pages competing to be found. Having said that, she has a good presence across a range of sites – her own website comes top, closely followed by her Goodreads page, her Twitter account, Facebook and Amazon. 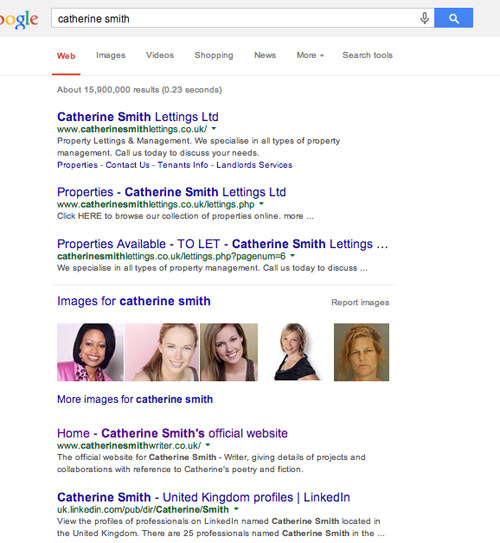 Once you have your keywords/phrases, you need to ensure they appear on the page you are optimising. This could be your blog ‘about’ page, or a page on your website or blog where you’re promoting your latest book, your author profile on a third-party site, or all of the above – it’s up to you. Try to select just one or two keywords/phrases per page. If you try to be found for too many phrases then your page loses its specificity and its relevance to a search become diluted. In the HTML of the page – Title, Description, Alt text (for images), Link Titles … you may or may not have access to all of these, depending on the blogging or webpage software you use. But these are all elements scoured by Google. Good SEO plugins for WordPress (self hosted) are All in One SEO or Yoast. It’s important not to ‘keyword stuff’ as you’ll get penalised for that. It’s important that your page still sounds natural and reads well. Write for your reader. There’s nothing worse that the ‘death by SEO’ articles that are all over the web – generally written purely with search engines in mind and devoid of useful content. In part 2 I’ll talk a bit more about authority, links and how social media works with SEO.